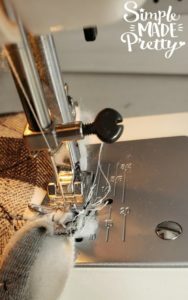 This is the perfect sewing project for a beginner sewer. 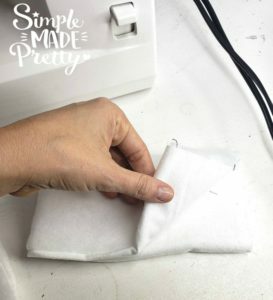 I’ll teach you how to sew a Christmas stocking with a cuff but you can eliminate the cuff if you don’t have enough fabric or feel too inexperienced to add a cuff. 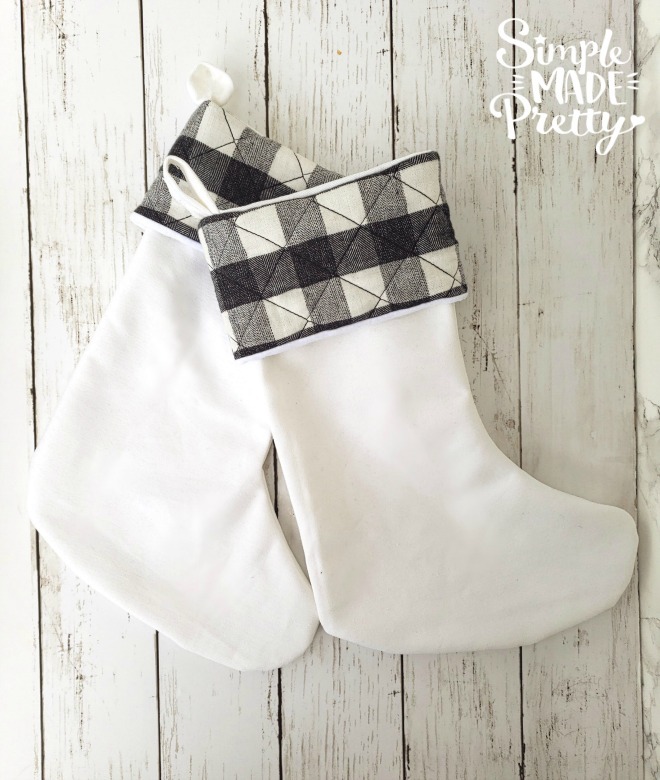 You can also hand sew Christmas stockings but I use a sewing machine in this tutorial. 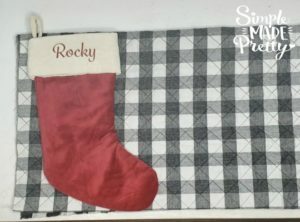 If you are wondering how to make a simple Christmas Stocking or want to make your own buffalo plaid stockings then keep reading! I also share a video below with How to make a Christmas Stocking! You’ll need a Sewing Machine to make this project. If you don’t have a sewing machine, you can easily hand sew Christmas stockings, it just takes a bit longer. I’ll show you how to sew a Christmas stocking with cuff below. These DIY Handmade Christmas stockings were so cheap and easy to make that I ended up sewing 10 stockings in just a couple of hours. The cost of the fabric and materials ended up being $1.67 per stocking! That is super cheap compared to spending $12-$24 per stocking at a store – plus these are high-quality materials and I was able to personalize them to match my home decor. Do you like this buffalo plaid fabric? I found a quilted buffalo plaid fabric at Joanne Fabrics! It was $19.99 per yard and I got 1.5 yards to make 5 buffalo plaid stockings and had enough fabric leftover to make 5 buffalo plaid cuffs for the white stockings. Gather supplies and watch the video below for more details. I used another stocking as a pattern for my stockings. 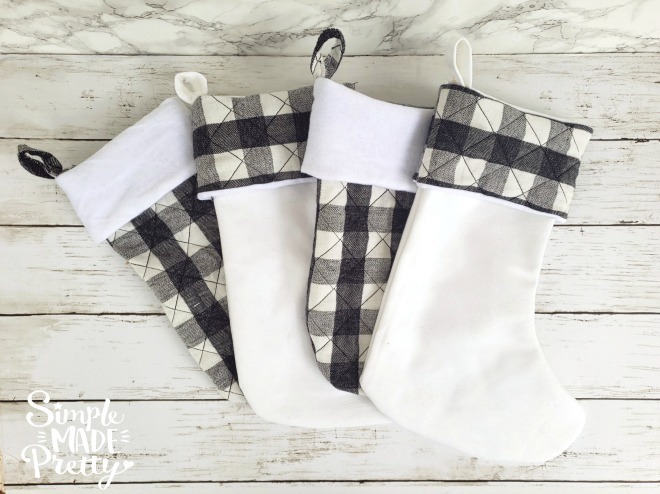 You can use an old stocking or find free printable templates online. My stocking was larger than 8.5 x 11 paper so I do not provide a stocking template. Tace the stocking pattern onto your fabric using a fabric marker. Use scissors to cut out the pattern. I folded my fabric and cut 2 at the same time, then cut along the fold at the top. Place the 2 stocking pieces right sides together. Sew around the edge except for the top. Cut a strip of the additional fabric (mine was white and cut 3.5″ x 14″). Cut the batting the same size as the additional fabric. Place the additional fabric and the batting together right sides together and stitch along the top side only. Flip right side out and fold in half with the batting on the outside. Sew the end to create a cuff. Flip inside out so the batting is on the inside. 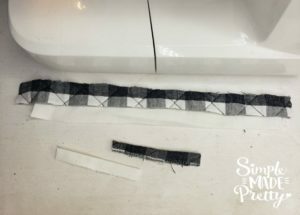 Cut a 1-inch long strip of fabric to create a fabric loop hanger. I just stitched this together with the stitching showing but you could stitch right sides together, then flip right side out. Cut to your desired size for the loop. Mine was approximately 4 inches. Fold the loop and place inside the stocking, on the left side. Place the cuff inside the stocking so the unsewn edge is facing out. Make sure the (white) fabric is against the stocking and the batting is what is showing when you open the stocking. Sew around the edge of the stocking to attach the cuff and the loop to the stocking. Flip the cuff around the outside of the stocking and you’re done! 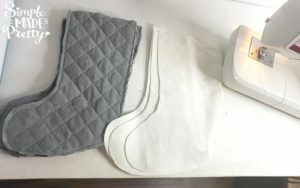 Tip: I had some extra WHITE cotton twill fabric on-hand and was able to use it to make 4 MORE white stockings and use the leftover buffalo plaid fabric as a cuff on the white stockings. Then I hung the stockings on a stocking hanger that I built since we no longer have a fireplace in our new home. A tutorial on the DIY stocking hanger is coming soon!